The Imagination Technologies PowerVR GX6450 is a fast mobile graphics solution for smartphones and tablets, which can be found in ARM SoCs such as the Apple A8 (iPhone 6 and iPhone 6 Plus). The chip is available since Q3/2014 and of one of the fastest solutions in its class at the time of introduction. The GPU is based on the PowerVR Series 6XT (Rogue) Unified Shader architecture and integrates four clusters with two TMUs and 32 FP32-ALUs each. Therefore, the theoretical FP32 (full precision) compute performance per clock is identical to the previous G6430 (also 4 clusters) found in the Apple A7. Thanks to additional dedicated FP16-ALUs, however, the also important FP16 (half precision) performance has been greatly improved. In the iPhone 6, the GPU should be clocked at around 450 MHz, delivering about 115 GLOPS (FP32). Compared to other mobile graphics solutions, the GX6450 outperforms the Qualcomm Adreno 330 (Snapdragon 800/801) and matches the more recent Adreno 420 (Snapdragon 805). Except for Nvidia's power hungry tablet chip Tegra K1 and its bigger cousin GX6650, the GX6450 is one of the fastest mobile GPUs in late 2014. Even the most advanced games and high resolution displays are handled without any problems. Among others, the GPU supports OpenGL 3.x/4.x, OpenGL ES 3.0 as well as DirectX 10. Thanks to the advanced 20-nanometer process and the relatively low clock rate, the GX6450 implementation in Apple's A8 offers a very high energy efficiency. On the other hand, the GPU has a comparatively "wide" architecture requirering a lot of transistors and die size (19 mm² in 20 nm). The Imagination Technologies PowerVR GXA6850 is a fast mobile graphics solution (mainly) for tablets, which can be found in ARM SoCs such as the Apple A8X (iPad Air 2). The chip is available since Q3/2014 and of one of the fastest solutions in its class at the time of introduction. 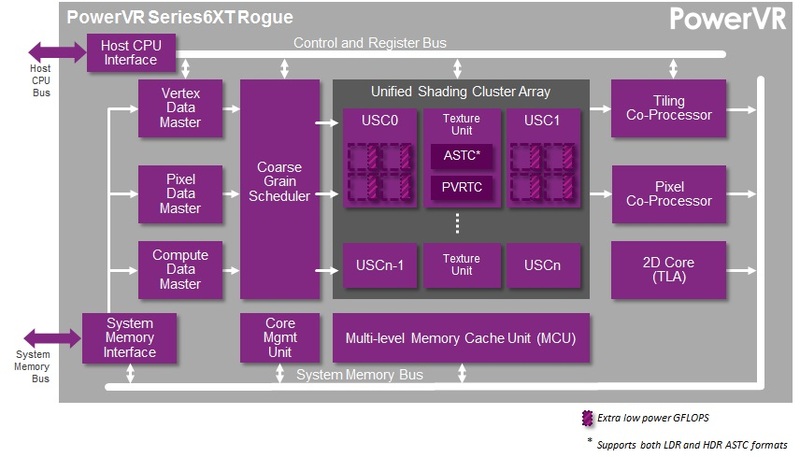 In contrast to previous speculations, the A8X integrates an 8-cluster PowerVR Series 6 (Rogue) GXA6850 consisting of two GX6450 GPUs (2x 4 clusters) instead of a single GX6650 (6 clusters). The name GXA6850 has been created by Anandtech, the design may also be called a GX6450MP2. Each cluster offers four FP16 and two FP32 ALUs, leading to a compute power of about 230 GFLOPS FP32 at 450 MHz (clock rate estimated). The GXA6850 does not only beat the Qualcomm Adreno 420 (Snapdragon 805), but also the Nvidia Tegra K1 by a small margin. Thus, the GXA6850 is one of the fastest tablet GPUs as of 2014 and can handle even the most demanding mobile games in high resolutions. Among others, the GPU supports OpenGL 3.x/4.x, OpenGL ES 3.0 as well as DirectX 10. Thanks to the advanced 20-nanometer process and the relatively low clock rate, the GXA6850 implementation in Apple's A8X offers a very high energy efficiency. On the other hand, the GPU has a comparatively "wide" architecture requirering a lot of transistors and die size (about 38 mm² in 20 nm).